« Dip netting is one of the activities available at the free event. The Sarasota Bay Estuary Program (SBEP) and Around the Bend Nature Tours are hosting a National Estuaries Day celebration September 24 at Ken Thompson Park near Mote Marine Laboratory. The free event will present fun learning activities and exhibits for adults and children of all ages from 9 a.m. to 2 p.m. One of the highlights is an opportunity for area children to compete for prizes by presenting their own exhibit or activity celebrating the importance of estuaries. 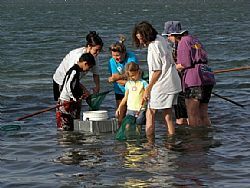 Around the Bend Nature Tours will provide dip nets to give visitors an up close encounter with aquatic life. Participating exhibitors include Mote Marine Laboratory, Sustainable Sarasota, Anna Maria Turtle Watch, New College Public Archaeology Lab, Manatee Audubon, Friends of National Wildlife Refuges, Florida Native Plant Society, Save our Seabirds, and Sarasota County Extension. The SBEP Bay Guardian volunteers will also be on hand early in the morning to clean up the area as part of the National Coastal Cleanup Day. They will be joined by a group of volunteers from Trinity Christian Fellowship Church. Visitors to the event can also receive a discount admission to Mote Aquarium. Pick up a special SBEP sticker at the Mote booth and wear it to Mote Aquarium to take advantage of the discount. The discounted admission is $10 per person. Brad Tanner, the SBEP Bay Wise kayak tour guide and Mote employee, will provide a Paddling 101 course from 10 to 11:30 a.m. Participants will need to bring their own kayak. Other groups interested in participating with a family-friendly activity or program should contact Karen Fraley with Around the Bend Nature Tours at (941) 794-8773. The designation of a national estuaries day underscores the importance of estuaries as a vital habitat for juvenile fish and shellfish. An estuary is a water body where freshwater mixes with salt water from the sea. The estuaries in the U.S. provide vital habitats for a wide variety of fish and shellfish species. Estuaries are regarded as one of the nation's most valuable natural resources, creating more food per acre than the richest farmland. Sarasota Bay is one of 28 nationally protected estuaries in the U.S. The SBEP has participated in more than 200 projects related to habitat restoration or water quality improvement within the Sarasota Bay watershed since its inception in 1989. A dozen restoration projects are currently in planning, permitting or construction phase.